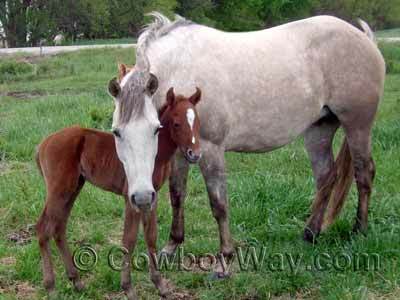 Use this horse gestation calculator to find out when your mare's due date! Or, you might prefer to use our handy horse gestation table. Below: A mare hangs her neck over her foal. Type the date the mare was exposed in mm/dd/yy format. Do put in the slashes ( / ) but don't use dashes ( - ). Type the number of days of gestation you would like to calculate. Click the "Estimate Date Of Birth" button. The estimated due date is now shown!